If you would like to enjoy year-round color in your flower beds, you have to go to the garden center in spring with one concept foremost in your mind: continuous sequence of bloom. Simply picking out plants that bear great-looking flowers in late spring will not get the job done. They look wonderful at the time, but you must think ahead to when they will not be in bloom. What will take their place as a color provider? Happily, there are plants that flower both before and after them, so the key for beginning gardeners is to become aware of these choices. Foliage plants can pick up some of the slack, too. You also must add some evergreens to your landscaping to have visual interest in your yard 365 days a year. Indeed, planting trees and shrubs is a great idea to achieve year-round color. They offer interest through their form and foliage as well as through their flowers. Any gardener seeking great color needs perennial flowers, so let's learn about eight outstanding choices cold-hardy to at least USDA planting zone 5. Early spring is a magical time of year. 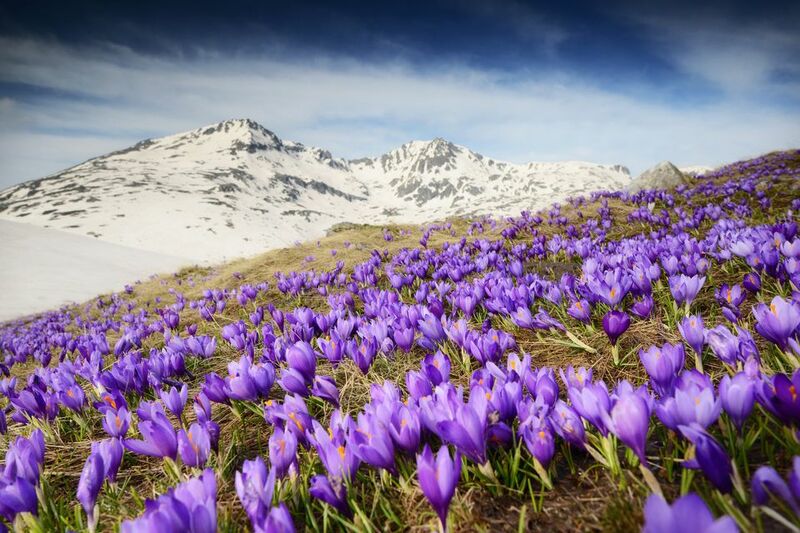 Some of the first plants to greet us with flowers during this period are bulb plants. You are probably familiar with many of these and value them for their early-blooming quality. 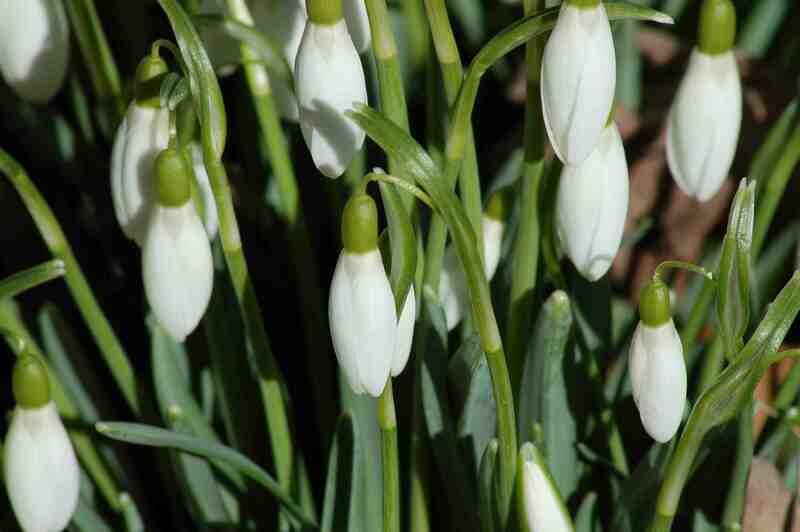 Snowdrops (Galanthus nivalis) is one of the first to bloom, but Crocus will not be far behind. Bulb plants are a wonderful idea, but think outside the box to create even more color in your flower beds as soon as winter's snow recedes. Consider that hunk with the yellow petals, Adonis vernalis. It is an herbaceous perennial, not a bulb plant. It's similar in appearance and in terms of blooming period to winter aconite (Eranthus hyemalis), which is a bulb plant. One drawback in growing bulb plants is that, after their blooms have faded and dropped off, your flower bed is still left with their leaves. Nor should you remove the leaves until they have turned brown, because, as long as they're green, they're sending much-needed nutrition down to the bulbs. Here's the problem: These leaves, which are no longer attractive at this time, make for an eyesore in your landscaping. These plants are classed as "spring ephemerals": They don't last for long. They put on their unique flowering display in April (in zone 5) then disappear. There's no gangly foliage you have to leave standing around cluttering up your flower bed. Dutchman's breeches are related to bleeding hearts (D. spectabilis), which offer a better-known choice for landscaping in mid-spring. Most gardeners are well aware of the value that the traditionally-grown peonies (Paeonia lactiflora) bring to your flower beds in May. But if you're looking for an idea that may be new to you, consider so-called "tree peonies" (P. suffruticosa). No, they're not really trees. Although they're classified as "sub-shrubs," they function more or less as perennials in your flower beds. Whether you grow P. lactiflora or P. suffruticosa, you can count on colorful blooms large enough to turn heads. The weather warms up considerably in June in many regions. So does the flower bed, because that's when torch lilies (Kniphofia; also commonly called "red hot poker plants") come into bloom. They bloom in a number of different colors (yellow, orange, red, etc. ), including the mango orange color of Terra Nova Nursery's Mango Popsicle. As long-blooming perennials, the color they bring to your landscaping extends through late summer. The flower stalk of a torch lily is made up of many small flowers. Those at the bottom of the stalk go by first. As they do, their color fades, while the top part of the stalk remains a vibrant color. The effect is often two-toned (for example, orange up top and yellowish down below). Sticking with the orange theme for early summer, a selection that is reddish-orange is Firebird coneflower. July is lily month. If you don't grow Lilium Stargazer, specifically, at least try growing one of the other types. Sure, some people regard them as "tired," but the rewards they offer are still as great as ever. This includes the fact that they are among the most fragrant of flowers. Easter lilies (Lilium longiflorum), incidentally, despite their common name, bloom at this time in the Northeastern U.S. if you grow them in your landscaping (as opposed to buying greenhouse stock). Late summer is when the floral baton is handed to some of the old standbys, including garden phlox or "tall" phlox (Phlox paniculata). Something of an oddity is the Nora Leigh cultivar, which bears both variegated leaves and bi-colored flowers. Black-eyed susan is another old-timer that supplies ample landscaping color in late summer. Not only do its blooms last a long time, but it is also a drought-tolerant perennial, which comes in handy in the scorching heat of August. Autumn needn't represent a "fall from grace" in terms of color in your flower beds, even if you live in a cold climate. Montauk daisy (Nipponanthemum nipponicum) is one option you have to extend floral color well into autumn. Also called "Nippon daisy," cut back Montauk daisy in early summer so as to gear it to a fall blooming. Cutting it back keeps it more compact, which improves the fall display. We'll conclude by looking at three shrubs that aid your perennials in providing floral color, starting with Candy Oh! roses. Shrubs are part of the "bones" of a landscape. From early-spring flowering shrubs to those bushes that bloom in late summer, growing a good mix of shrubs in your yard is one of the easiest ways to ensure that you will have something nice to look at throughout the spring and summer. Rosa Candy Oh! bushes furnish your flower beds with blossoms at a time of year when many shrubs are valued more for their fall-foliage color than for their flowers. As landscape roses, they're low-maintenance, but that's not their only good quality. If you care about creating year-round color, you'll love the fact that they bloom deep into autumn. Since they don't mind being pruned, you don't have to be afraid to prune them aggressively so as to keep them small in your flower beds. "Flowers for winter" sounds like an oxymoron if you live in the North unless we're talking about interiorscaping. But winter heath (Erica x darleyensis) is the exception to the rule. This plant, which is related to heather, can begin blooming in November and can continue to bloom right through the winter months of December, January and February, and even on into spring. True, winter heath's flowers are tiny, but what they lack in size, they make up for in numbers. Besides, any flower that blooms outdoors in winter in a cold climate is appreciated, regardless of its size. Winter heath is a small shrub, small enough that it will fit right into your flower bed as if it were a perennial. There are many kinds of jasmine, including winter jasmine (Jasminum nudiflorum). Grow it in a sheltered spot if you live in the North, and it will reward you with blooms in February. That brings us full circle because we began with plants (snowdrops and Adonis) that bloom in March. Winter jasmine could also be classified as a vine plant. It can be easily maintained at a small size via shearing. How you shape it during pruning will determine whether it ends up looking like a shrub or a vine.